On New Year’s day when most people were tucked up warm in bed after celebrating saying goodbye to 2015 and welcoming 2016, young volunteers from the Ahmadiyya Muslim Youth Association (AMYA) were up at the crack of dawn to clean the streets in Glasgow.They picked up litter in the Yorkhill area, Kelvingrove, Argyle Street, Dumbarton Road and Haugh Road after their early morning prayers at their Baitur Rahman Mosque in the west end of Glasgow. The clean-up is one of a number of initiatives that AMYA set up over the Christmas periodThe group also visited the sick children at the new Children’s Hospital and gave them gifts, collected money for Yorkhill Children’s Charity and distributed food to the homeless and an elderly home in Glasgow. Earlier in the month they also dispatched volunteers to assist with the Cumbria Relief Effort. The youth were also involved with other cleanup activities in Glasgow. 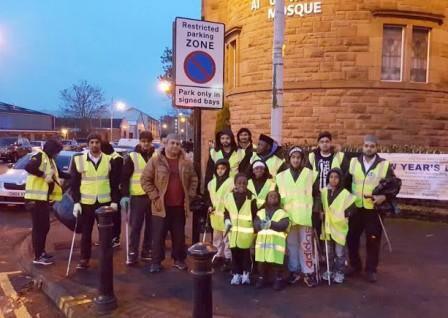 Share the post "Glasgow’s Muslim youths clean the streets on New Year’s Day"